Because success as a biologist means more than just succeeding in the first biology course. For instructors concerned that the practical skills of biology are lost when the student moves on to the next course or takes their first step into the “real world,” Principles of Life 3e lays the foundation for later courses and for students’ careers. Expanding on its pioneering concept-driven approach, experimental data-driven exercises, and active learning focus, PoL 3e introduces features designed to involve students in mastering concepts and becoming skillful at solving biological problems. Research shows that when students engage with a course, it leads to better outcomes. Principles of Life 3e is a holistic solution that has been designed from the ground up to actively engage students in mastering concepts and becoming skilled at solving biological problems. Within LaunchPad, our digital teaching and learning solution, we provide thoughtfully curated assignments and activities to support pre-lecture preparation, classroom activities, and post-lecture assessment. 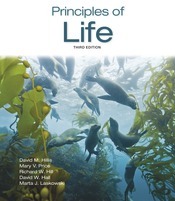 With its focus on key competencies foundational to biology education and careers, self-guided adaptive learning, and unparalleled instructor resources for active classrooms, Principles of Life is the resource students need to succeed.